Why would you need a YouTube plugin for Drupal? Can’t you just use the embed code? Yes, yes you can. However, you may run into a client where copying and pasting the embed code becomes too technical. So lets forget about why we need this and I’ll explain how to get it set up. After switching over to Drupal 7, I decided to use the WYSIWYG module to implement text editors instead of custom built modules for text editors. This now allows us to keep up to date with the latest release of editors like CKEditor, TinyMCE, etc. Since you just drop them into the libraries folder and they will work. I am going to start by assuming you have your site, and editor installed and working properly. 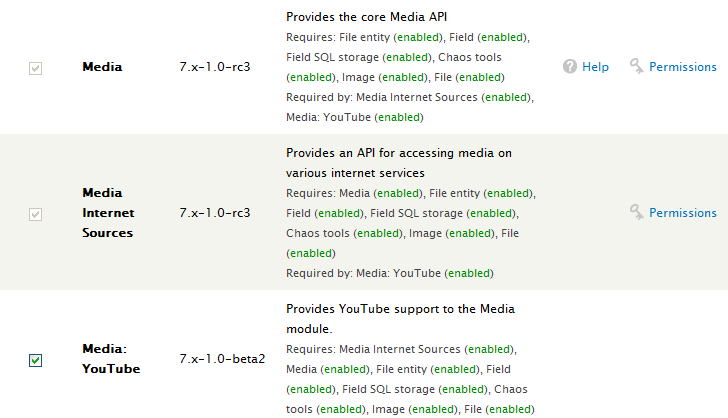 Next download and enable the media and media_youtube modules. Two things left. Enabling the markup, and setting the permissions. Then all that is left is to make sure every role has the correct permissions, look under the “Media” category. Comment below if you have any problems. Hello. I have in my profile admin/config/content/wysiwyg/profile/full_html/edit. There are no media, but there is a media browser. I did everything according to your description. In what could be the reason? Worked perfectly for what I needed, thank you very much! It’s worth noting that the “Buttons and Plugins” area has been changed a bit, you need to check off ” Plugin for inserting Drupal embeded media ” under Editor & Appearance for the button to display on on the add/edit content areas.